First up, the acts from your own backyard, inside our own solar system. The Sun is the star of that show, and at the Chandra X-Ray Observatory's Blog, Scott Wolk introduces the new solar cycle, while Carolyn Collins Petersen describes the Solar Dance. As Brian Wang of Next Big Future explains, en route to Venus is IKAROS, a spacecraft whose recent achievement, the first How to talk to aliens." (Best line in that one: "Nothing has been heard yet (unless it was filtered into the spam box) and we are still waiting.") But Mike Simonsen will be the first to tell you that there's probably no aliens to be found in the extrasolar planet HD 209458b system, recently discovered to have a comet-like tail. In any case, we may not have to go as far as extrasolar planets to find life; Bruce Leeeowe at WeirdSciences explains panspermia: how bacteria could survive trips into and through space, spreading life across the solar system. Moving beyond the planets, Allen Versfeld attempts an accessible answer to the question "What is a black hole?" over at Urban Astronomy, while Steve Nerlich of Cheap Astronomy presents a podcast on Stellar Archaeology. And Ian O'Neill at Discovery Space cautions us about getting too excited about the recent rumors of the Higgs boson possibly being discovered at Fermilab. Finally, Emma at We Are All in the Gutter discusses one of my pet peeves, the bizarre and tortured acronyms that are popular in astronomy (and indeed science in general) these days and moves on to describe a cool experiment named GADZOOKS!. Oy. That article led me to the absolutely wonderful Dumb Or Overly Forced Astronomical Acronyms Site (or DOOFAAS). Which, despite its length, lacks most of the tortured acronymmy names of recent space missions and their instruments. 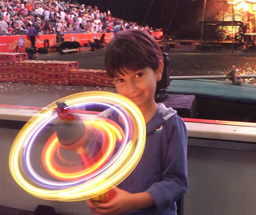 Thanks for visiting the Carnival of Space at The Planetary Society Blog! Stick around here, or subscribe via RSS, and you can read about ongoing and past missions across the solar system and the beautiful images that they have returned to Earth. I even sometimes give tips on where you can find obscure images and how to process them to make them beautiful.